A deeply nourishing balm similar to our Blue Moon Butter. Made with amazing ingredients like Kokum butter, apricot seed oil, Argan oil and more, this balm glides smoothly onto any part of the skin. Made to soften the driest spots, this balm is a solid state version of a whipped butter. Similar ingredients but with beeswax! Scented with Roman chamomile, neroli and magical blue tansy essential oil! 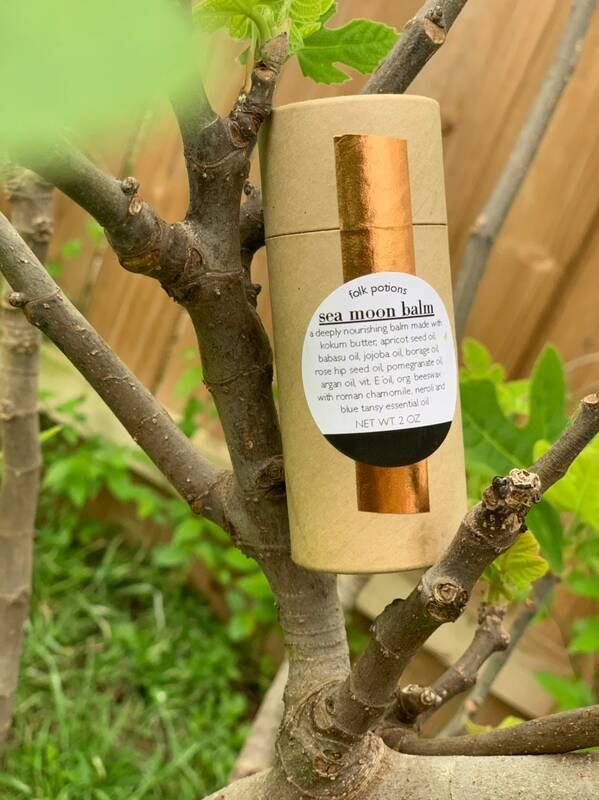 The Sea Moon Balm is a fabulous salve. It is light but super moisturizing. The smell is amazing. I use as a full body moisturizer after my shower. This is my new go-to night cream. After a good scrub I apply the balm to my face and neck and go to bed. In the morning I look like I'm 5 years old. It's bonkers. Smells great (of course - that's the Folk Potions way) and is in cute, tidy packaging.